RANCHO PALOS VERDES, Calif., — Sgt. Justus Branson, a platoon sergeant with Fox Company, 2nd Battalion, 7th Marine Regiment, looked on as his brother in arms, Pfc. Roger Gonzales, was lowered to his final resting place. Gonzales died 68 years earlier at the Chosin Reservoir while serving with Fox Company. Branson was part of a group of over 40 Marines who drove from Marine Corps Air-Ground Combat Training Center Twentynine Palms to attend the funeral of Gonzales. “The presence of so many Marines indicates the honor that we give for those who lay down their lives for their Country and their fellow citizens,” said Chaplain Daniel Fullerton, the chaplain for Headquarters Battalion, 1st Marine Division. Chaplain Fullerton delivered the invocation during the funeral. 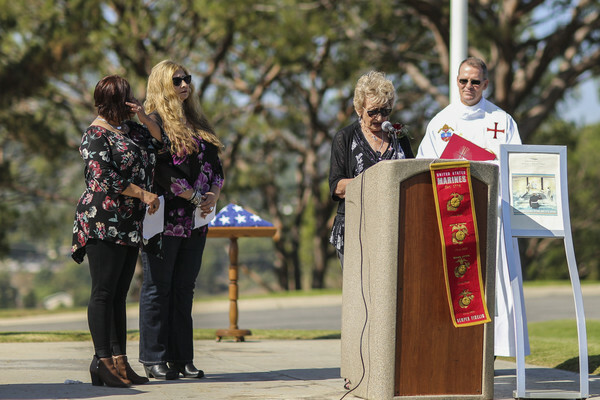 The group of Marines traveled to Rancho Palos Verdes, Calif., to pay their respect to Gonzales, whose remains had been identified and transferred to the Gonzales family, 68 years after he was killed in action during Fox Company’s last stand at the Chosin Reservoir. “Even if we were in the middle of a huge training operation, we would’ve driven across the country for this, without a doubt,” said Branson. Family, friends, and service members from across the US paid their respect to Gonzales as he was laid to rest, next to his mother Anastacia, at Green Hills Cemetery. The bond that exists between the Marines and those that have gone before them is a sacred and timeless connection. Pfc. Gonzales shared some of the same bonds and experiences during his time in the Marine Corps that the Marines share and experience now. During those times, men, ages 18 to 26 were drafted into the U.S. military and required to serve their country for the war ahead— some men didn’t need to be drafted. Such was the case for Pfc. Roger Gonzales, a San Pedro, California native. Shortly after graduating high school, Gonzales enlisted in the United States Marine Corps Reserves and two years later found himself in North Korea with Fox Company, 2nd Battalion, 7th Marine Regiment, 1st Marine Division. Ezell continued by sharing that when he and Gonzales arrived to Korea, they were placed into the same company, but in different platoons. At the time, the U.S. X Corps, which consisted mainly of the 1st Marine Division and the Army’s 31st Regimental Combat Team, occupied the Chosin Reservoir. On Nov. 27, 1950, the Chinese force surprised the U.S. X Corps at the Chosin Reservoir. From November 27 to December 13, 30,000 United Nations troops (later nicknamed “The Chosin Few”) were encircled and attacked by approximately 120,000 Chinese troops. They were nicknamed the Chosin Few because of the inferior number of troops and the location of the battle. The conflict lasted a brutal 17 days, which took place during some of the harshest weather conditions and roughest terrain of the war. The extreme weather conditions caused the weapons lubricant to freeze, rendering the troops’ weapons useless, and by the end of the fighting it had come to hand-to-hand combat. It would come to be known as one of the most gruesome battles of the Korean War. The war claimed the lives of more than 30,000 U.S. troops. “After the first firefight, his cousin called me and told me that Roger had been killed on top of the mountain pass, Toktong Pass,” said Ezell. Gonzales was buried at the base of Fox Hill. After the war, his remains were disinterred and returned to the U.S. but could not be identified at the time. However, through scientific advances and DNA tests from Gonzales’ younger sisters, Alicia Vallejo and Mary Rosa Loy, that changed. On June 4, 2018, the Defense POW/MIA Accounting Agency was able to identify Gonzales’ remains. After nearly 68 years of uncertainty and unanswered questions, the Gonzales family was finally able to honor their Marine who gave the ultimate sacrifice. For today’s Fox Company Marines, they felt they had to attend the funeral to make sure Gonzales was laid to rest with a proper goodbye from his unit.